Drivers can pay via Visa, Mastercard, American Express or PayPal on their phone. The currently has a fleet of 46 company cars, including 24 ULEVs, in line with the company’s policy of encouraging all staff who are eligible for a company car to opt for a ULEV. 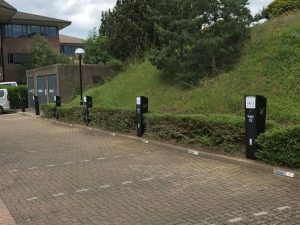 Each of the AutoCharge pedestals are equipped with Rolec’s EV Charge Online pay-to-charge system, enabling drivers to use their mobile phone to pay to charge using Visa, Mastercard, American Express or PayPal. Last year also saw Tusker partner with ChargedEV to complete its customer installations, offering a range of brands to suit customer requirements.